Life is full of important questions. Democrat or Republican? Ketchup or mustard? The Beatles or Elvis? None, however, are as important as the question we’ll address here, today. Inground or above-ground swimming pool? It seems like such a simple question, but there are many factors involved. Fortunately, the pool builders in Utah, Intermountain Aquatech, have the answers you’re looking for, and they’ll help you solve this age-old question for yourself. Each type of pool has advantages and disadvantages, so there is no definitive answer, unlike some of life’s other questions (The Beatles, obviously). Space, cost, aesthetics, safety, and the effect on your home’s resale value are all factors. We’ll discuss each of these factors as we compare the two types of pools. When most people think of a pool, an inground pool is the picture that comes to mind. At its most basic level, inground and above-ground pools serve the same functions—relief from the heat and entertainment on a hot summer day. That’s where the similarities end, however. Here is a brief comparison of the two types of pools, as defined by the criteria we discussed in the introduction. Technically, an inground pool can take up as much or as little space as you’d like it to, while above-ground pools have set sizes. We build custom pools that are designed to fit the look and feel of any space. With that in mind, full-featured, rectangular inground pools are normally 10×20, 15×30, or 20×40 feet. You’ll need some space around the pool, as well. 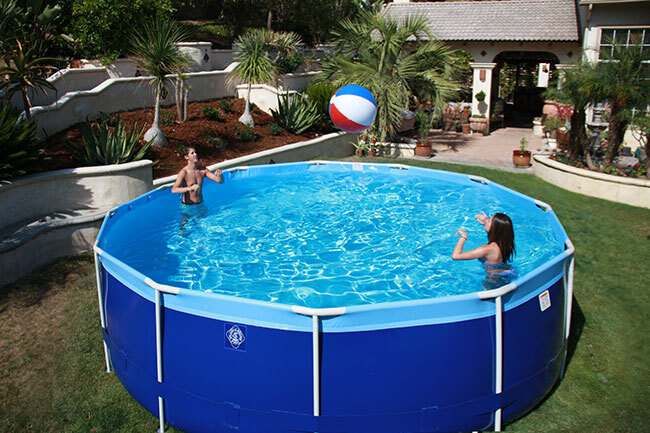 Above-ground pools range in size from 13-feet round to 18×32 feet. That’s quite a range, but the take-away here is that, generally speaking, a full-size inground pool will take up more space. Another advantage of the Above-ground pool is that it’s much easier to remove if you decide you’d rather use the backyard for other purposes. There are exceptions to every rule, but as a general rule, a custom inground pool will cost more than a comparable above-ground pool. Most people will say that an inground pool is better looking than an above-ground pool. There are an infinite number of variables, however. A well-designed above-ground pool with a well-built deck will add beauty and utility to any backyard. At the same time, a well-designed inground pool, properly landscaped and maintained, gives your backyard a stunning centerpiece and entertainment focus. There are dangers associated with just about any recreational equipment, and swimming pools are no exception. Any swimming pool, whether above-ground or inground, should be treated with respect. Inground pools are generally regarded as more dangerous than above-ground pools, because a person is more likely to fall in unintentionally. If this is a concern with your inground pool, there are several companies that make attractive barriers to secure the pool area. This metric will vary from area to area. For example, a swimming pool will increase the value of a home much more in an area with especially hot summers. 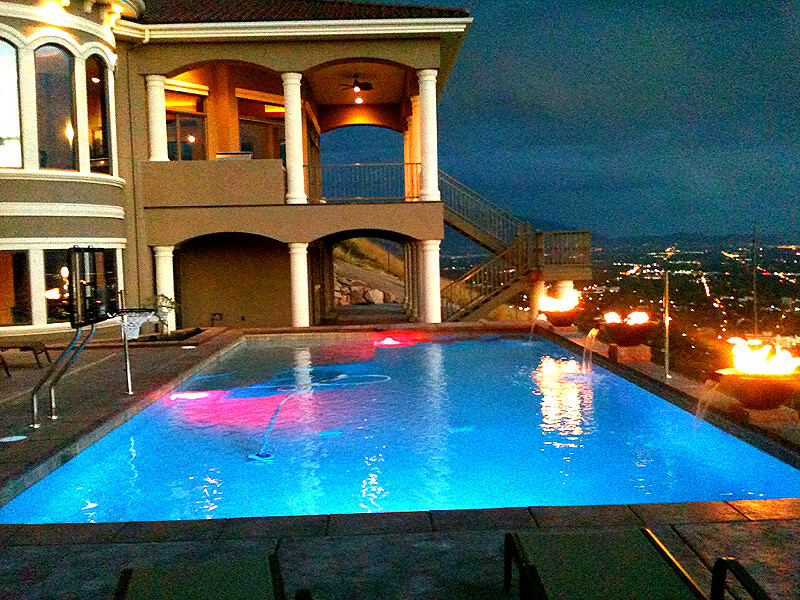 In Utah, for example, either type of swimming pool will have a positive effect on a home’s value. Swimming pools are actually pretty rare in Salt Lake City, so it’s the perfect way to set your home apart (and make it the most popular house in the neighborhood during the summer). A swimming pool, no matter which type you choose, makes a great addition to any home. Inground pools, while generally more aesthetically pleasing, are more expensive and more permanent. Your decision depends on many factors. If fun in the sun and a little relief from the heat of the summer are what you’re looking for, you can’t go wrong with either.